Winter's 'Berry' Favorite Color? Red! Yaupon holly and possumhaw brighten the winter landscape. Spring and fall get all the attention with their showy blooms and radiant leaves, but winter in Texas can be lovely and colorful as well, just in a different way. Punctuating the bare branches and somber fields are bright necklaces of crimson, cheerfully distracting us from the winter doldrums while sometimes providing a feast for hungry wildlife. Two natives lead the way among those plants offering red berries this time of year: yaupon holly and possumhaw. Yaupon holly (Ilex vomitoria) is an evergreen shrub or small tree and is found primarily in the moist woods and limestone uplands of Southeast and Central Texas. Tiny flowers on female yaupons in the fall yield red berries that — though poisonous to humans — feed birds and mammals. Native Americans once brewed a strong tonic from yaupon leaves and twigs, both of which contain caffeine. Tribes would sometimes guzzle the “black drink” to induce vomiting (hence, the species name of vomitoria). However, yaupon leaves contain no toxins and yield a fine tea. Just roast some leaves in the oven until they’re brown. Also called deciduous holly, possumhaw (Ilex decidua) — Texas’ most wide-ranging native holly — grows as shrubs and trees in East Texas pineywoods westward to the Edwards Plateau. Unlike most evergreen hollies, such as yaupon and American holly, possumhaw drops its leaves, revealing a spectacular shimmer of crimson in winter landscapes. Another native plant, snailseed vine (Cocculus carolinus), also produces red berries loved by wildlife, but these grape-like clusters pop out before winter arrives. A freeze takes the leaves, and the birds remove the berries. Non-natives like pyracanthas (firethorn) are quite noticeable in the landscape, but the berries aren’t food for wildlife and the thorns are cruelly sharp. 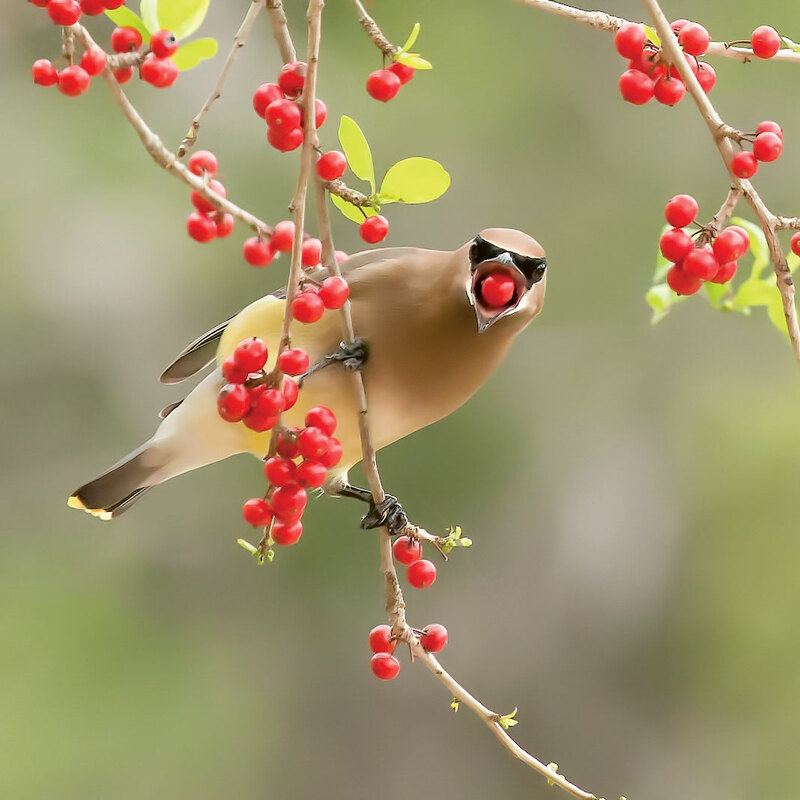 In one of our favorite wildlife postscripts, watch out for the most amusing antics of intoxicated cedar waxwings, which occasionally feast on fermented berries (berries have high sugar content) and have a bit of trouble flying afterward. Sometimes these dusky cardinal-like birds will pass berries back and forth during courtship or just to be neighborly. So “berry” sweet.